Director Anthony Mann had his work cut out here to make a halfway decent picture from such a ridiculous story and on a minuscule budget. 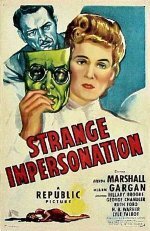 Brenda Marshall appears as the research scientist, badly scarred in a fire, who returns after plastic surgery with a new face and identity, seeking to regain her fiancé from the rival who caused the blaze. The director draws good performances from his cast, which includes Hillary Brooke as the bad girl, and builds an atmosphere of oppressive tension. But it doesn't have the right cameraman or sufficient time to give the images a true film noir look.